Suggested Applications: Use for all solvent-based gasketing, anaerobic gasketing and gasket sealant products. Use to remove Permatex Form-A-Gasket®, Spray-A-Gasket®, Indian Head®, High-Tack™, Tack & Seal™ and Super High Tack™ gasketing products. 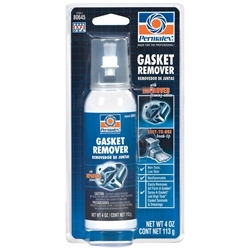 This Gasket Remover is NOT recommended for silicone gaskets (use Permatex® Silicone Stripper™ – part number 80649).